Baby mattresses are just as important for a baby’s good sleep as an adult mattress is for an adult’s good sleep. There are a lot of baby mattresses on the market to choose from. These top rated baby mattresses top the list in performance, comfort and quality. Choosing a crib mattress does involve careful consideration for many reasons. It is important to choose the best baby mattress you can afford when you get your crib. When it comes to choosing a crib mattress, it may look like they are all the same, but there are many different types and thicknesses of crib mattresses available to choose from. Since the baby will spend a lot of time sleeping on their mattress, you want to make sure that it fits properly and that it is firm and comfortable for the baby. You don’t want there to be any gaps between the mattress and the crib bars that can pose danger threats to the baby. You also don’t want the mattress to be too soft which can also be dangerous for your baby. These top rated crib mattresses are very popular among parents and parents to be due to their firmness, performance, quality and durability. Any one of them will work well for your baby. If you are looking for a good quality mattress with plenty of firmness, look no further than the Sealy Firm Rest Crib Mattress. 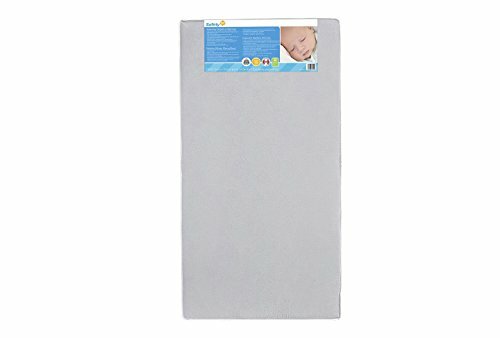 This durable and ling lasting mattress works for newborns and grows right along with your child through the toddler ages as well. It has 204 coils and a full perimeter border wire that secures the edges to offer plenty of firm support for your baby. The Sealy Firm Rest Mattress fits all standard cribs and toddler beds. There is an anti-sag weight distribution system in the center of the mattress that keeps it from sinking in the middle after a time. The cushioned wrap is hypoallergenic and provides your baby with plenty of comfort. The Staph-Guard anti-bacterial surface is also anti-static and gives hospital grade protection. Bacteria will not spread and odors won’t linger. The waterproof surface wipes clean easily and makes cleaning up after any accidents a breeze. The GREENGUAR GOLD certification means your baby will have a much healthier indoor sleeping environment. 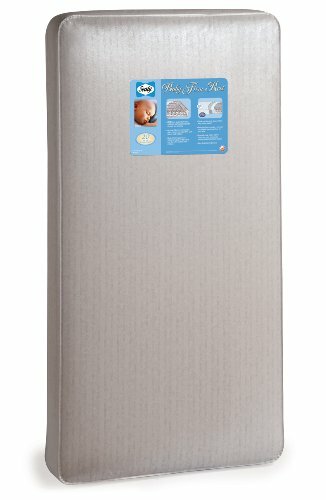 The Sealy Firm Rest Crib Mattress measures 52” x 28 and is 5.5” thick. It meets or exceeds the flammability standards without using any chemicals. The heat tempered coils and convenient side pocket allows cool air to circulate. Construction of the mattress includes a secure wire around the perimeter that your toddler can even sit on without affecting the shape and support of the mattress. There is a 20 year warranty on this great mattress which means you can use it with all of your babies and not lose one bit of firmness or support. My First Memory Crib Mattress is your baby’s first introduction to the world of memory foam mattresses. The extra firm, high density foam is perfectly supportive for your baby and is safe too. Measures 51 5/8” x 27 ¼” and is 5” thick. It has square corners that fit snugly in the crib to prevent any spaces or cracks that can pose a hazard to little arms and legs. 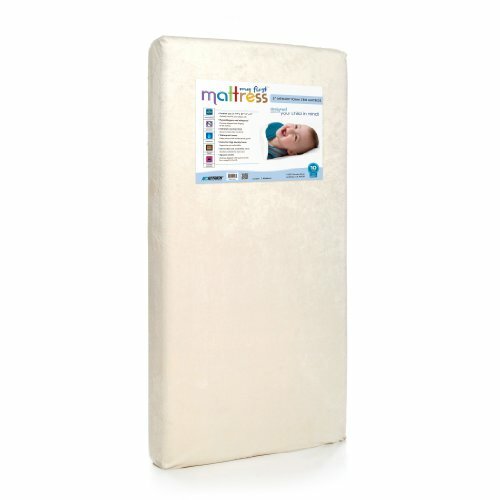 This memory foam crib mattress is hypoallergenic, mite proof, anti-microbial, waterproof and washable too. It is also lead free and phthalates free as well making it a safe and reliable choice for your baby’s crib. It is made from CertiPUR-US certified flexible polyurethane foam and meets or exceeds flammability and CPSC standards providing even more peace of mind for new parents and experienced parents alike. The waterproof cover prevents mold and bacterial growth and can be wiped off with a wet rag easily in the event of any accidents. The removable plush velour cover is super comfortable for your baby and is machine washable too. Upon arrival the crib mattress is vacuum packed and rolled and takes a few hours to reach the dimensions. It also has a 10 year warranty. Safety 1st is a well known and respected name in the baby industry for a multitude of baby products, including crib mattresses. This Heavenly Dreams White Crib Mattress meets the standards for low chemical emissions which will provide your baby with, not only a comfortable sleep, but a safe one too. The mattress is lightweight and durable with a high density thermo-bonded core that gives your baby the perfect amount of firmness. With a water resistant cover, this mattress wipes clean easily in the event any accidents occur. The vinyl surface is hypoallergenic which is perfect for any babies or toddlers that suffer from allergies. It has achieved the GREENGUARD GOLD certification. This Heavenly Dreams Crib Mattress from Safety 1st fits all standard cribs and toddler beds. The cover is durable and resistant to stains and odors. It also meets the federal flammability standard 16 CFR 1633 but doesn’t use harmful chemicals to achieve it. This mattress is also free of phthalates and lead as well. Measurements of this crib are 52.5 L” x 27.5 W” x 5.5”H. One of the few places your baby will ever be without immediate supervision is their crib. Because they will be in it without someone right there in the room with the, at all times, it stands to reason that you want to look for the best and safest crib mattress you can find. All three of these top rated choices are perfectly safe for the baby’s crib and will provide the parent with plenty of peace of mind. There are many different types of crib mattresses available. It may seem overwhelming to sort through the potential hype that some manufacturers may use to try and get their product to stand out, but that is what these reviews and the following buyer’s guide is for. With this information you will be able to sort through the choices easily and determine which baby mattress you want for your baby. Having the knowledge to make an informed decision is important to ensure the right mattress is purchased. What is a Baby Mattress? A crib mattress is exactly what is the name implies; a mattress that fits in a crib or toddler bed. It is made up of many different materials that can include coils, memory foam and regular foam. They are designed to provide a firm, supportive sleeping surface for your baby. Your baby will use his or her crib mattress for 2-3 years and even beyond if they switch to an official toddler bed. Crib mattresses can last years and through multiple children with the proper care. If you notice sny tears in the vinyl covering or notice any sagging, it is time to get a new mattress. Using one that is subpar can leave your baby at risk for problems. The quality if a crib mattress is dependent upon what it is constructed with on the inside. There are a few different types of materials that have been used to make crib mattresses. This buyer’s guide will outline the different types of crib mattresses that are typically available. We will outline the benefits and drawbacks to each so you can make an informed decision about the best crib mattress for your baby. Foam crib mattress – A foam crib mattress is the cheapest and lightest weight of all the crib mattresses. It is constructed of one or more blocks of foam inside a vinyl covering. The foam can be made of polyurethane, bamboo fiber or latex among other materials. It is a good choice for a portable crib. Latex is a more expensive type of foam but is more durable than polyurethane which has a tendency to sink after awhile. It can come in a variety of firmnesses. The more firm the foam is the better and safer it is for your baby. A foam mattress will measure anywhere from 3 to 6” in thickness. Coil Spring Crib Mattress – Another name for a coil spring mattress is an innerspring mattress. The inside of a coil spring mattress is made up of a number of steel coils that make up the core of the mattress. They are a lot heavier than foam mattresses. Even though many manufacturers list the number of coils the mattress has, a lot of coils does not necessarily mean that it is a more comfortable mattress. When looking at a coil spring mattress, look at the thickness of the coils and not the number. You want the gauge of coil to be 15.5 or lower. The lower the gauge the thicker the coil is and that means the more support it will provide. You do not want to purchase a cheaply made coil spring mattress. Poor quality mattresses will squeak and wear out quickly as well. Coil spring mattresses are more expensive than foam, but they last longer if they are made with a higher quality coil. Pocket Spring Crib Mattress – Pocket spring mattresses also use coils of steel to support the baby or toddler. The difference between a pocket spring mattress and a coil spring mattress is that the coils are sewn into material pockets. Each pocket is separate and moves independently. Each coil will compress according to the weight applied. This means the coils supporting the baby’s torso will compress more than the ones supporting the baby’s legs. This provides perfect support for the baby’s whole body. They are long lasting and very comfortable and one of the more expensive types of crib mattress. Memory Foam Crib Mattress – Memory foam is not just for adults anymore. Some crib mattresses are constructed of high quality memory foam that is temperature sensitive and, molds to your baby’s body shape. Once the baby is taken out of the crib, the mattress will go back to its original shape. If the nursery is not very warm, the memory foam mattress will feel hard but will slowly conform to the baby’s shape as they lie on it. Air circulation is reduced on a memory foam mattress. This means the mattress will feel warmer than the other types of mattress. In colder climates, this works well as it is an additional means of warmth for the baby, but it has potential problems in warm climates. Most memory foam baby mattresses have a coiled spring core with memory foam layers over it. These mattresses cannot be flipped for this reason. Natural Latex – This material is a natural alternative to the petroleum based foam. Coconut Fiber – A very highly breathable type of material. Read lots of reviews when it comes to getting a good natural crib mattress. You want to find out how much of the crib mattress is made from natural materials if you are researching and considering a natural crib mattress. Read a lot of reviews on the natural mattresses you are looking at. The benefits of a natural crib mattress include being chemical free, long lasting, very breathable and is a very good choice for those who suffer with allergies. Some of the disadvantages to choosing a natural crib mattress are that the firmness of the mattress will vary with the material used and they are not as common as regular crib mattresses. There are several things to look for and consider when it comes to choosing the right baby mattress. We’ve outlined several of the most common and important features of a crib mattress that should be taken into consideration when you start shopping. Mattress cover materials – A crib mattress is covered in many different types of materials. The purpose of the mattress cover is to keep the inside of the mattress contained and inside and it also protects the core from dampness, dirt and other problems that would cause it to break down. Some baby mattresses have nylon covering them which is a tough durable material that reduces the chances of tears and holes. Mattress covers are almost always waterproof so they prevent leaking diapers and drooling from soaking into the core and breaking it down. Cleaning is super simple with a waterproof baby mattress cover. What is the Firmness of the Mattress – You want to look for a baby mattress that is very firm. It is the safest choice for your baby. A soft crib mattress is a hazard to your baby and should not be used. Firm mattresses lower the incidence of SIDS as well. Get a Hypoallergenic Mattress – A hypoallergenic baby mattress can be a real benefit for many reasons. If your baby has known allergies, a hypoallergenic baby mattress can reduce the symptoms of allergies and help the baby sleep a lot longer. Well ventilated Mattress – You want to purchase a baby mattress that is well ventilated and has good air circulation. The presence of fresh air prevents odors, mildew and mold from building up inside the mattress. Most baby mattresses are made of materials that breathe. Some models include plastic or metal vents on the side of the mattress that help it to breathe. How heavy is the mattress? – If you are trying to lug around a super heavy mattresses at sheet changing time, it could get very tiring very quickly. Lighter weight mattresses are not less in quality and in some cases; they are better quality than some of the other choices. The heavier the mattress the harder it is to change the sheets. Flame Retardants – Mattresses can b e very flammable. All crib mattresses, by law, must meet or exceed standard requirements regarding flammability. Flame retardant means that if for some reason the mattress has fire come into contact with it, it won’t burn up in seconds. It is not fireproof, but it is flame retardant. Many models are providing that flame retardance without adding chemicals which enhances the safety factor. Baby mattresses are an important purchase that you should consider carefully. Don’t just buy the cheapest mattress you can find. You want to look for the mattresses that are built for quality, durability and long lasting-ness. These factors that we have outlined will help ensure that your choice is one that provides comfort and comfort for your child and last for 203 years until they are in a regular sized bed. Taking care of the mattress you purchase will help you make sure that it lasts as long as possible. This proper care comes in the form of keeping it clean, not using over the weight limit, not having it around sharp objects and more. This attention to the care of your baby mattress will help it last for many years and through several children.